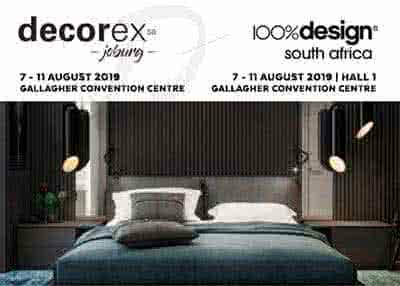 Decorex Joburg takes place from 7 - 11 August 2019 at Gallagher Convention Centre. Here you`ll see the finest concepts and products from a collection of expertly curated designers and manufacturers. As the African continent is positioning itself as a global style icon, fusing the influences of international trend-makers with the unique colour and vibrancy that characterises its people and cultures. The impact of this colourful continent on the 2019 lifestyle trends will be brought home through the features and products showcasing at Africa`s biggest decor and design exhibition Decorex SA. This year`s much-anticipated theme `Designing for Africa -feels like home` encapsulates the re-birth of the African style powerhouse. Don`t miss the collocated show 100% Design South Africa which is a high-end curated showcase of the most inspirational designs and designers. Gallagher Convention Centre, 19 Richards Drive, Off Ben Schoeman Highway, Midrand. Venue has a ramp entrance, a special parking area and toilet facilities for disabled patrons.